The photo yield for this photo ink cartridge is 90 photos. The Page Yield can vary depending upon the amount of content printed onto each page. What is OEM? 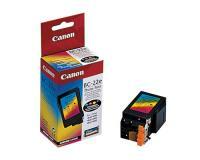 OEM photo ink cartridges are assembled by Canon for your Bubble Jet Printer. Also known as "genuine" ink cartridges, these are meant to act as a premium alternative to compatible or re-manufactured photo cartridges.